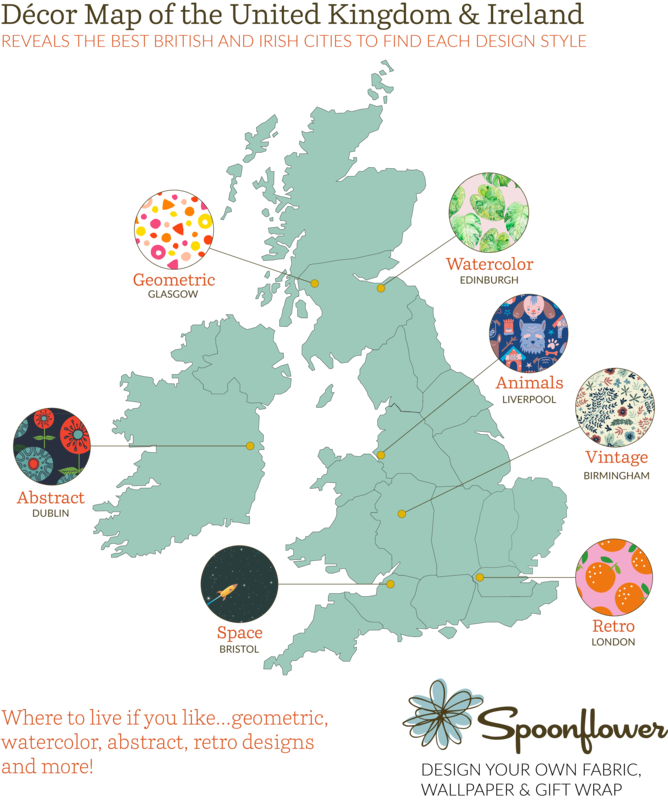 A ground-breaking new "Décor map of the United Kingdom and Ireland" identifies the best cities in the UK and Ireland to live for fans of each of various design styles – from retro to animals and geometric to space. It reflects data from nearly 200,000 purchases on the website Spoonflower, which lets customers design, print and sell their own fabric, wallpaper and gift-wrap. “Our decor map for the United Kingdom and Ireland shared interesting insight into the design tastes of British and Irish cities,” says Allie Tate, Marketing Manager for Spoonflower’s European team. Spoonflower designates as the "capital" of each design style the city where a higher share of customers than anywhere else have purchased that style. The findings of its study confirm some expectations, while confounding others. London, for example, is capital of retro designs – highlighting the city's rich history and appreciation for timeless design. It likewise makes sense that Bristol ranks top for Space designs given the presence of aerospace research and initiatives in the city. Edinburgh shows its trendy side as being the watercolor capital of the United Kingdom, while it’s neighboring city Glasgow shows preference for geometric designs. The tradition of the world-famous Grand National horse race shows through in Liverpool as it takes the title of Animal Capital. Birmingham, a city famous for innovation and creativity is a bit of a surprise as the vintage capital. And Dublin rounds out our list as our community most interested in abstract designs. "Space" and "watercolor" are not traditional décor styles in the same sense as, say, retro or geometric, but they qualify for Spoonflower’s map as niche décor categories which are scarcely available elsewhere. Spoonflower is the world’s leading source of space fabric and wallpaper designs, with over 3,500 unique examples on offer for this theme alone. Spoonflower crunched the data from nearly 200,000 recent purchases by its customers of custom fabric, wallpaper and gift-wrap – and organised them under categories that each represented one design style. In order to avoid the biggest cities topping the the rankings for each style simply due to having more people, Spoonflower weighted the scores by calculating the number of customers for a particular in any given city by the total number of Spoonflower customers in that city. That gave a better measure of the popularity for each style in any city and identified the city where each style was most popular. This press release was distributed by ResponseSource Press Release Wire on behalf of Spoonflower in the following categories: Entertainment & Arts, Leisure & Hobbies, Home & Garden, Women's Interest & Beauty, Retail & Fashion, for more information visit https://pressreleasewire.responsesource.com/about.